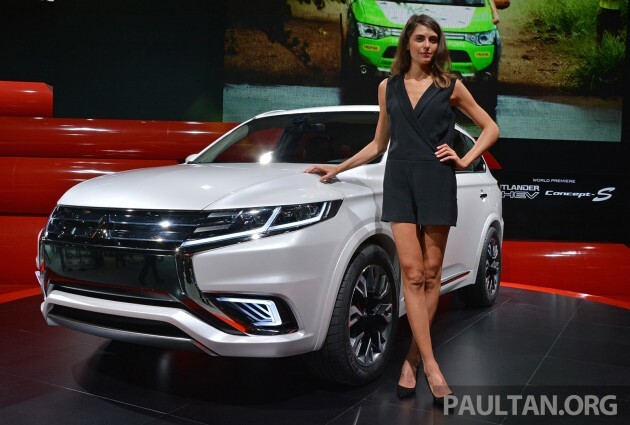 Another Paris debutant was Mitsubishi’s Outlander PHEV Concept-S, which previews what the company calls “a special design package” for the production Outlander PHEV. The SUV gets a new cleaner and sharper-looking “X-shaped” front-end, complete with new wraparound headlamps. The rear also gets a new look, led by a fresh elongated combination lamp design, the cluster spanning across the tailgate in winged fashion. The study is dressed in a Platinum White exterior with a glass flake finish. The interior, meanwhile, goes with a “Black & Burgundy” colour scheme. There’s black woodgrain trim with silver accents, and there’s a centre console design inspired by Japanese traditional black lacquered boxes. The seats are dressed in soft hand-stitched leather, with the upholstery forming a 3D surface with horizontally-ribbed cushioning. No mechanical revisions to the five-seater, which is powered by a combination of a 2.0 litre MIVEC Generator petrol unit and a Twin Motor 4WD system comprising independent electric motors to drive both front and rear wheels, coupled to Mitsubishi’s S-AWC (Super All Wheel Control) integrated vehicle dynamics control system. We’ve tried out the Outlander PHEV in Japan – read our short test drive report.